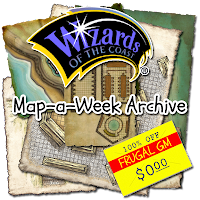 This week's Free GM Resource is another collection of assorted maps from the folks over at Wizards of the Coast. Back in the day they used to have this awesome thing called Map-a-Week. I wish I was good better at making maps because this is the kind of thing I'd love to do here on this blog. Ahh.....maybe someday. Until then, I'll just find pre-made maps I can use as needed. The Map-a-Week archive gives you a listing of eight years of maps! By my quick GM math that means if you were to print these out and try to carry them around you would be encumbered according to most RPG rulesets. The most difficult thing you'll have to deal with is simply sorting all these maps into some workable system. You might not use all of the maps, but I'm certain that any enterprising GM can get some use out of this great resource.